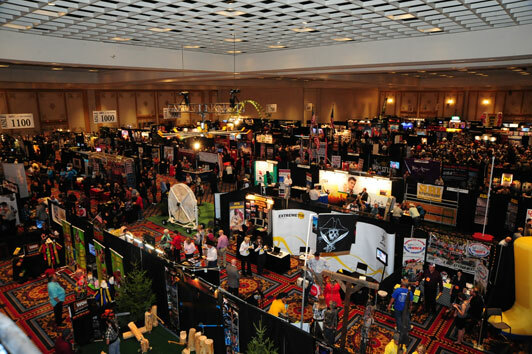 Why Should You Exhibit in the IAFE Trade Show? The 399 booth Trade Show is the LARGEST show in the fair industry with a total show attendance of over 3,000! Promote your business to OVER 400 FAIRS AND EVENTS that have at least one representative at the IAFE Convention. Booth Information: Each booth in the IAFE Trade Show is 8 feet deep by 10 feet wide. Booths are draped (black drapes) and include one identification sign for each exhibiting firm. Standard booth rates are $1,200 for IAFE members and $1,300 for non-members (per booth). A $100 corner/premium aisle charge will be added to the exhibit space amount for each corner space. Space will be contracted beginning May 1. Exhibitor Priority Points will determine placement for those applications received prior to May 1. Assignment after May 1 will be based on the date the application is received. A nonrefundable $300 deposit per booth will hold your space until Aug. 1, when the entire balance of your selected booth package is due. Exhibitors needing electrical outlets and furniture may order these items at an additional cost through the show service providers. An online exhibitor service manual will be made available to exhibitors approximately three months prior to our show. "Being a member of IAFE has dramatically increased our band's business and exposure not only to a national audience but to the international community as well. I have been an IAFE member since October 1994 and can tell you that membership is worth every penny. Case in point, several years ago, I attended the IAFE national convention in Las Vegas. I spent three days networking, handing out business cards, and meeting great folks. By the end of the convention, I had an offer to play at an international music festival in Shanghai China! Three years ago the Circle City Sidewalk Stompers had the honor of being one of the convention's featured main stage performers. From that exposure in addition to being a vendor, we secured three additional out of state gigs. This year alone, you'll find us as the Indiana Pacers Pep Band and in close to 300 shows at other fairs, festivals, and corporate events. We're also working on festival requests that will take us back to several different countries in Europe. On behalf of the entire Circle City Sidewalk Stompers Clown Band, I thank the IAFE for your many years of support and assistance." "Exhibiting at the IAFE tradeshow allows us a great opportunity to meet with fair representatives from all over the country in a very efficient format. It is amazing how many times you look at someone and go 'we have talked on the phone for years, it's a pleasure to meet in person.'" "The IAFE Trade Show is the ONLY place you have a chance to meet face to face with decision makers from most of the major fairs and events in the country. It's the one show we WILL NOT miss every year!" Mark Sparks, Vice President, Triangle Talent, Inc.
"The IAFE Trade Show is an essential element in our product's visibility across the fair industry. The effectiveness of all other trade shows that we have exhibited at cannot add up to even one time of exhibiting at an IAFE Trade Show. It is and will remain our primary means of exposure." "Having attended many years of IAFE conventions I have found it always very beneficial to be on the exhibit floor meeting new fair members and letting our newer associates get to know them. Our booth has always been a place for impromtu meetings and a focal point for our presence for the convention and our company."